Star Wars: The Last Jedi became a surprisingly polarizing topic over the weekend. Rian Johnson's box office behemoth debuted to rave critical reviews, earning a 93% score on Rotten Tomatoes. The fans on Rotten Tomatoes seemed to tell a different story though, as the audience score for the movie was just in the mid-50 percent range, the lowest of the franchise. The legitimacy of this low fan score was called into question when an unknown social media user claimed they created multiple fake accounts to drive the film's score down. If that wasn't enough evidence to prove that the numbers on Rotten Tomatoes may have been skewed, a global Social Intelligence company called Synthesio has studied the various social media platforms in regards to the film and found that fans were actually pretty positive about what they saw. Synthesio simply broke down Twitter and Facebook reactions into positive and negative sentiments, just as a Rotten Tomatoes score is the average of only good or bad ratings. The company found that, of every social media post about The Last Jedi this weekend, 70.04 percent of them were positive. Just 29.96 percent were negative. This tells a much different, and likely much more honest story than the Rotten Tomatoes numbers. Bots and fake accounts could have easily logged on to the review site and said something negative. However, Synthesio's findings studied nothing more than the reactions people were posting to their social media accounts. Sure, not everyone is honest about what they say on social media, so there are probably a few trolls hidden in those numbers, but that exists in any sort of study. The majority of people still shared their opinions of the movie publicly, and almost 3/4 of those folks had nice things to say about Rian Johnson's work. Between Synthesio's findings and the overwhelmingly positive exit poll numbers from CinemaScore, it seems like audiences are enjoying The Last Jedi much more than the Rotten Tomatoes audience score suggests. 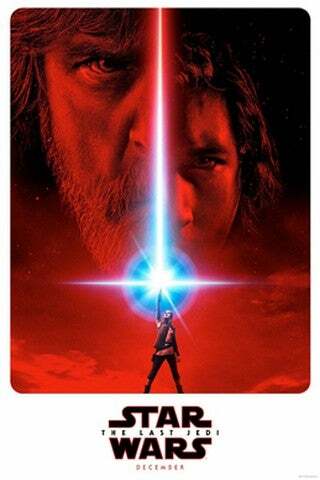 What did you think about Star Wars: The Last Jedi? Let us know by rating the film below!